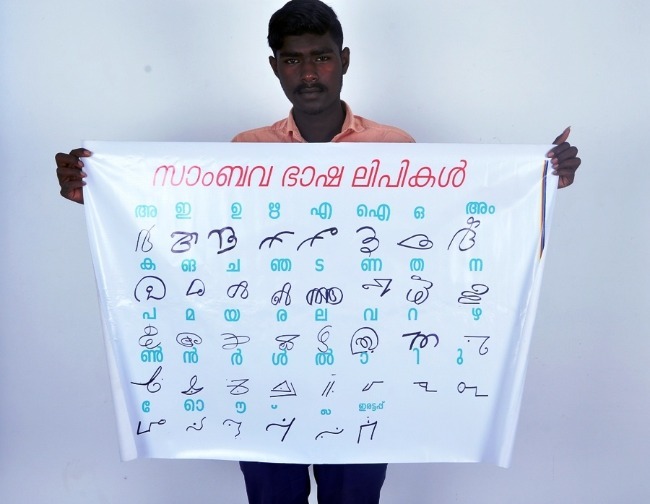 17-year-old AP Akash developed the 25-letter alphabet with the help of Swamini Sivanandan, a budding poet from the Sambava community. The state of Kerala, which is home to innumerable dialects and languages, has been largely ignorant of this language which the members of Sambava, one of the largest Dalit communities in the state, used. In earlier days, the language was used by members of the community to communicate secretly. It is one of the ancient vocal languages in India but it never had a script. However, 17-year-old AP Akash has recently developed a script for Sambava. The teenager heard it for the first time three years back when his 85-year-old grandmother Varajini Devi and Swamini, his relative, used the “secret language”. Varajini Devi and her son Vijithrakumar also used the secret language. “I did not understand a single word but I became curious. This prompted me to collect details about our traditional language,” he recalls. Akash shared with Swamini his ambition to come up with a script for Sambava. The two joined hands and then began the arduous task of forming a script for this secret language. MI Madhavan, an Ernakulam-based teacher, also contributed to their efforts. The 25-letter alphabet was approved by the Bharatiya Dalit Sahitya Akademi, which also appreciated the efforts of the teenager. 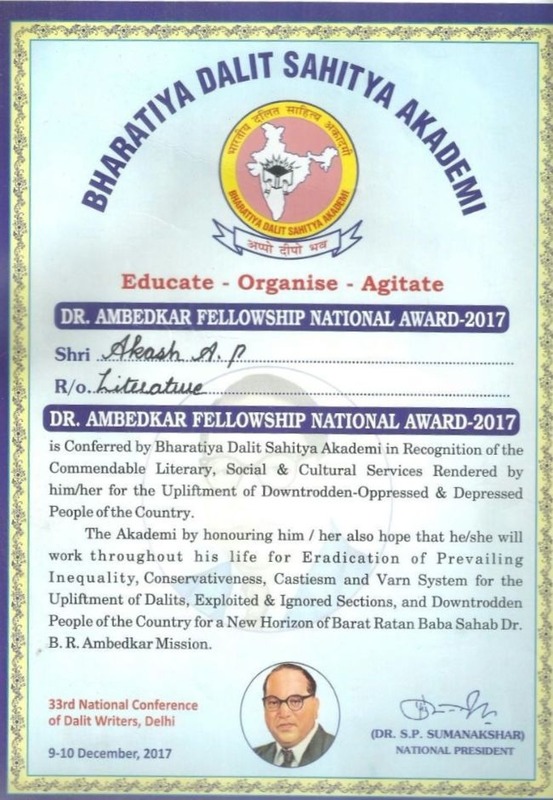 Akash was presented the Bharatiya Dalit Akademi Youth Icon award. Akash received the award in New Delhi last December. The script was released at a function in Kothamangalam in Kerala recently. The youngster now also aims to develop linguistics for the Sambava language. “Coming up with the linguistics for a language is a very complex task. We have begun the groundwork needed and it will be completed soon,” he says resolutely. Akash started his journey by picking up simple words like milumpi (eye), moluntval (look) and molunthaval (present continuous form of ‘look’). Later the teen and his team picked up other words. What began as a small project became a larger effort. “At first I would verify it with my family members but gradually I realised I needed more help,” he says. The formation of the alphabet and script was a tough and tedious task. He started the work in 2015 and completed it only in 2017. He now aims to bring national attention to the alphabet and hopes to ensure it gains the status of an ancient language. When we look at the status of languages across the world, some astonishing facts emerge. According to a report in Smithsonianmag, by the year 2100, the human race will have lost about half of the 7,000-plus languages in use today. Every 14 days a language dies. Roughly a third of the world’s languages have fewer than 1,000 speakers left. Meanwhile, just 23 languages account for more than half the world’s population. The disappearance of a language is not an isolated incident in itself. For many native speakers, losing their language means losing cultural heritage and history. But hearteningly, there have been quite a few success stories of fading languages being saved. National Geographic reports that in rare cases, political will and a thorough written record can resurrect a lost language. Hebrew was extinct from the fourth century BC to the 1800s, and Catalan only bloomed during a government transition in the 1970s. In 2001, more than 40 years after the last native speaker died, the language of Oklahoma’s Miami tribe started being learned by students at Miami University in Ohio. A few years ago, LA Times reported how the elders of the Yurok, California’s largest Native American tribe, did not let their language die. While those involved in reviving a language usually include parties such as linguists, cultural or community groups, or governments, it is commendable that young people from the Sambava community have understood its significance and are working towards it. According to the last census, there are about 7 lakh Sambava community members in the state, making them a dominant force both in the political and social lives of Kerala. However, it is a sad fact that these days the Sambava language is not learnt to be used widely. It was popular in Idukki and Wayanad districts, Thiruvalla in Kottayam, Kollam and in the Perumbavoor (Ernakulam district) area. The social oppression and ostracism faced by many Dalits made them embrace Christianity in the late 1800s and early 1900s, and their cultural roots took a blow. However, decent living conditions and education was visibly better than the legacy. Swamini, however, believes it is time to reclaim the lost glory despite the threats the community members have to face. “Some rightist goons had tried to hamper my efforts when they learnt that I was helping to develop a script for Sambava,” she claims, adding that it shows how insecure the so-called elites are in the proclamation of pride by Dalits. Most of the community members across the state, especially the current generation, are ignorant of this language, says Akash. “My mission is to revive the language within our community as a token of Dalit pride,” he declares. Swamini agrees: “The language is the tongue of the downtrodden and it should be given a new vibrant face, bringing it to the mainstream.” Their dream is a day when every Sambava in the state proudly boasts of their great cultural asset. Swamini is also a keen language researcher and has dedicated her efforts towards reviving ancient vocal languages. Emphasising her love for languages, she says, “In 2015, I created an exclusive love language called Agti Gumbowdi, which communicated love symbols,” she says. Several writers, especially those from Dalit society, are excited about the development of the Sambava script. Writer and Dalit critic Sunny M Kapicad says he is yet to see the script of any Dalit language and the effort is quite novel. “The language was being used as a medium of secret communication inside the community. It is a big leap if its alphabet could be developed, because it is getting its written identity,” he says. Sunny observes that for the past few decades the use of such internal languages has been largely reduced. “It is hard to conserve them without a proper script. Some similar languages are already facing extinction. It’s true in the case of tribal languages as well. Till date, I haven’t seen any tribal language alphabet,” Sunny says. Prominent linguist Prof Naduvattom Gopalakrishnan, who has been in the forefront of efforts to get Malayalam the classical language tag, said that he knew about the language but its script was new to him. “This is mostly a secret language,” Prof Naduvattom says. “The community members used it to pass secret messages, for example, when they want to alert someone about the presence of a higher caste man, they used the word ‘elumpikko’. What I understand is that the language was more common in Kollam district,” he adds. “Commonly the language was being used as a tool of self-protection by the Dalit community members against the oppressive, so-called upper caste people. It was also used to convey secret commands to their members,” says Prof Naduvattom. However, the linguist doubts if the language would have an existence outside the community. “The language is highly caste-oriented and it represents their value system and social realities. But, it is considered one of the oldest Dravidian languages,” he observes. Keeping small languages vibrant has always been a big challenge historically. Languages usually reach the point of crisis after being displaced by a socially, politically and economically dominant one, as linguists put it. In this scenario, the majority speaks another language, so speaking that language is key to accessing jobs, education and opportunities. For these reasons and others, languages are dying all over the world. UNESCO’s Atlas of the World’s Languages in Danger lists 576 as critically endangered, with thousands more categorised as endangered or threatened. Akash, however, is keen to make the impossible, possible. Son of Shalajan, a construction worker, and Bindu, a plantation worker, he does some part-time photography to fund his studies and to support his family. “I will pursue my studies and now I have a bigger dream to give my language the status it is worthy of,” a beaming Akash says. Akash’s efforts will definitely be helpful in the language getting attention again. The language now has a script, which will not only help preserve the language but also help the community teach the language to the next generation. In the past, several languages have vanished due to the lack of a script. But thanks to Akash, the Sambava community can be rest assured that its culture will stand the test of time for at least the next few generations.